I know I have said this before: indulge me. One of the first recorded histories of cinema is a little film that simply was a train moving and coming on to the camera. Anecdotes have it that people watching that simple shot for the very first time were so terrified that they ran out of the hall. Such was the power of the moving picture in an enclosed hall with a collective, shared conscious, that it set in stone what was to become cinema's one undeniable virtue and invariably, duty: spectacle. Avatar is a spectacle to behold like no other. In every sense of the phrase, this is a true James Cameron masterpiece. By which, of course, I mean that the film delivers spectacle and true pulp action adventure like only a master can, and has flaws that belong incontestably to Cameron. His talent for action and slavish attention to detail are legendary in any film-watching circle, and Avatar is cut from the same cloth. Unfortunately, the cloth has some smudges that must be dealt with first. It is not hyperbole to say that this is a result of 12 years of Cameron's hard work. It is also not far from the truth that this film also stands as a reflection of what matters or mattered to Cameron as a director. He has not only exorcised all his creative demons, he has made an intensely personal statement about other people's work in the process. More than a few people will notice shadows of Dances With The Wolves, Hayao Miyazaki and Edgar Rice Burroughs in this film. There are countless other obtuse, but unmistakable, allusions to other science fiction works of cinema as well. The way the film is singularly a Cameron film, though, they all seem like his reaction or need for reference than outright stealing. The story, of course, is the weakest link - Sam Worthington is Jake Sully, a paraplegic ex-marine who is asked to take over his deceased brother's spot as the 'driver' of a genetically linked 'Avatar' - a body that is an exact replica of the local fauna of an alien planet called Pandora. Called Na'Vi, these indigenous people have a deeply spiritual (and because this is Cameron writing, also literal) connection to nature, and simply want to be left alone. A large corporation wants to dig up their land to obtain a silly-named mineral, and is using the avatars as ambassadors. Of course, when Sully meets a Na'Vi girl called Ney'tiri and goes native, and when the corp decides to exercise the military option, things go south fast, and the hero must save the day, the girl, and himself. The aliens are the talk of the town, but only a master like James Cameron can lavish such detail on the humans. Acting as the audience's avatar on the military compound, Sully walks us through the facility, and everything feels so real and functional. The base, the equipment and especially the war machines look used, solid and workable. Of course, when the alien world is explored Cameron unleashes the aforementioned spectacle. Richly detailed and with great emotional heft to it, the world is stunning to behold, majestic to experience. Every little detail about the world is sculpted and presented with care and eye for glorious beauty. The actual Na'Vi characters are great. Not earth-shatteringly mad, as some may lead us to believe, but as the next evolutionary step after WETA's Gollum, these creatures look believable and brimming with emotion. Cameron likes to tell us the emotion through his characters theatrically, not show through actual depth - and the same is true here. The central conceit of pure indigenous people and evil pants-wearing white people is milked for all its clichÃ©d glory. How clichÃ©d? The awesome Wes Studi plays the Na'Vi war chief, that's how much. Despite, or perhaps because of, the sheer doggedness of the pursuit of the quintessential Cameron-ness of it all, this is not a serious impediment in your enjoyment of the film. Overall, it is probably the acting that sells the film more. Sam Worthington is in every frame of the film - he is our eyes and mind through every moment in the film, and he carries it through. He is likable enough, and his body chemistry is amazing to watch. Sigourney Weaver is the real surprise - she starts off as a standard exposition-handing role, but delivers nuances to it that make the film what it is. She is the most major character in the film in that she represents the drab human science and the unknown Na'Vi science equally, and has the ultimate relationship with the film's over-arching themes. Saying anymore would spoil it for you, but she is the key to the whole mythology. On the other end stands Stephen Lang. Much like Avatar is the culmination of a master director's life work, Avatar is the culmination of Lang's body of character work. Standing tall, chewing all the 3D scenery around and spitting forest moons in disgust, his is the sort of performance that rises to the tone of the film and raises it one hard-assed stare. His performance and physical work are what long-continuing fan discussions are made of, and in a just world he will be raised on the shoulders of his peers and feted by everyone. As should Cameron. This isn't the new sensibility cinema that Hollywood has gotten used to. This is brand new technology serviced to make an old-fashioned action adventure film with a deliciously pulp setting in a richly detailed and stunningly realized world, and no one but James Cameron could have made it like this. If you get tired of close to two hours of world exploration, Cameron still has 40 minutes of thoroughly mind-blowing action in store for you to shriek excitedly like a school girl over. The last 40 minutes prove without a doubt that Cameron not only still has it, he has it more than anyone who dares make a tent-pole film. Exhaustingly awesome aerial combat and intensely personal alien on machine combat later, when you see relief wash over you, you will realize that while this may be a bit derivative and dodgily written, it is still the most striking film to come out this year. I know James Cameron has done this before: indulge him. Such is the power of his flawed masterpiece experienced in a 3D cinema with shared collective conscious. It is virtuously and dutifully spectacular. Really outstanding movie. Some people say that not a great story and all that. Don't believe that. It is a great visual feast. I saw that movie in USA IMAX theatre in 3D. Fantastic feel, awsome movie. You may not see such kind of great visual feast in the near future. Don't miss it. fullhyd.com has 700,000+ monthly visits. 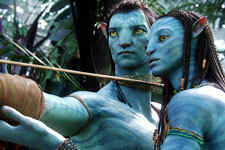 Tell Hyderabad what you feel about Avatar - 3D Version!